One strand of my research has looked at the psychosocial variables that affect travel behaviour, including attitudes, identity, impression management and norms. For too long, transport planning has centred around practical transport issues at the expense of psychosocial, affective, emotive and aesthetic issues that motivate people to use certain modes of transport. This has led me to develop the 3 stage transport motivation model. 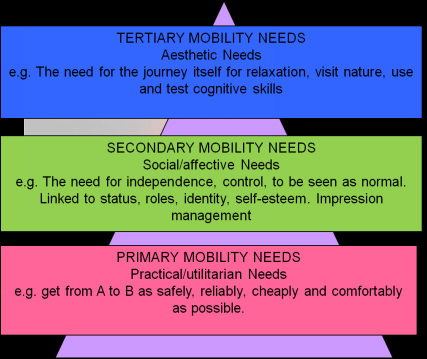 At the bottom stage people use transport for practical reasons, to get from A to B as quickly, easily cheaply, efficiency as possible, it is this level that people articulate most frequently and it is this level that strategies or polices to encourage people out of their vehicle are often aimed at. However, although this level is clearly important, transport fulfils two more transportation needs often overlooked by planners. First is associated psychosocial needs, such as the need to be seen as normal, the need for independence, freedom, status, roles and identity. At a third level I propose aesthetic needs the need for travel for its own sake, to feel movement, to see life pass-by, to enjoy using cognitive skills associated with safely propelling forwards. Some academic have suggested that this third level does stand alone and can in fact be placed within the other two categories, but I prefer to see it as sitting alone. Car advertisers have managed to sell cars around all three levels of need, strategies to encourage people out of their vehicles often only involve the practical level, information, cost, safety, reliability and need to start thinking more in terms of higher level needs. ​- Using game playing to encourage cycling among families (part of the Ideas in Transit Project with Mission:Explore), with Billy Clayton, EPSRC, 2011-2012. ​- Public attitudes to carbon calculators, Department for Transport, 2007-8. Chatterton, T., Coulter, A., Musselwhite, C., Lyons, G. and Clegg, S. (2009). Understanding how transport choices are affected by environment and health: views expressed in a study on the use of carbon calculators. Public Health, 123(1), 45-49. ​Musselwhite, C. (2012). Book review on Mobilities: new perspectives on transport and society by Margaret Grieco and John Urry (eds) (2011). Ashgate: Farnham Journal of Transport Geography, 25, 162. Musselwhite, C.B.A. and Musselwhite, B.A. (2017).Women finding their bearings in a man’s automotive world. Western Mail, January 27th, 30-31. Clayton, W. and Musselwhite, C. B. A. (2012). Cycling and Behaviour Change: Using games to improve the experience for families. Final Report of the research to support Geovation Misson:Explore project. University of the West of England, Bristol, UK. Grant, M., Smith, N. and Musselwhite, C. (2010). Active and low carbon travel a transport vision for Yeovil. Report for Department of Health South West. WHO Collaborating Centre for Healthy Cities and Urban Policy​, University of the West of England, Bristol, UK. Lyons, G., Musselwhite, C., Dudley, G., Goodwin, P. and Wiltshire, P. (2009). Business attitudes to transport. Knowledge review of existing evidence. Final report. Department for Transport. Owen, R., Sweeting, A., Clegg, S., Musselwhite, C. and Lyons, G. (2008). Public acceptability of road pricing. Final report, Department for Transport, London. Musselwhite, C.B.A. (2012). Boy racers, Dunkirk spirit and the Pompey bounce: The use of movement and mobility in impression management and identity formation. Unpublished paper. Musselwhite, C.B.A. (2011). Qualitative methods in transport studies. Unpublished paper. ​Musselwhite, C.B.A. (2017). Re-imagining Planning. British Society of Gerontology and Centre for Ageing and Dementia Research, Imagining Neighbourhood Event, Chapter Arts Centre, Cardiff, 27th March. Musselwhite, C.B.A. (2016) Deep mobility: Intuition, emotions and feelings for a better transport planning. Radical Transport Conference, University College London, 20 June. Musselwhite, C.B.A. (2011). Boy racers, Dunkirk spirit and the Pompey bounce: The use of movement and mobility in impression management and identity formation. British Sociological Association Conference, London School of Economics. Dudley, G., Goodwin, P., Lyons, G., Musselwhite, C. and Wiltshire, P. (2010). Lost in translation: Problems in interpreting business attitudes to transport. Proc. 42nd Universities Transport Studies Group Conference, University of Plymouth, January. Musselwhite, C.B.A. and Lyons, G. (2009). Exploring the public acceptability of road pricing. Proc. 41st Universities Transport Study Group Conference, University College London, January. Musselwhite, C.B.A. (2006). Improving Public Acceptability of Road Pricing. Invited paper at ITS UK Environmental and Road Charging groups, Leeds University, 9th November.